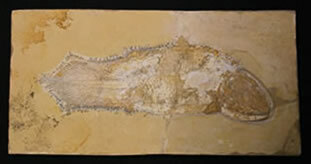 Comparative images of original fossils and painted replicas. 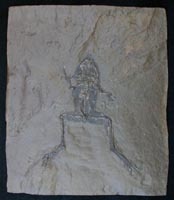 Unfortunately we do not have images of all the original fossils from which our replicas were made. However, we do have a sufficient number of them which should give you an idea of how closely we try to match the replica coloration to the original fossil. 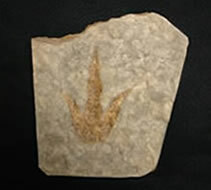 We will take a little artistic license where we feel it will improve the appearance of the replica, or to paint out flaws or detractors which were present in the original specimen. Because of the way we paint the replicas we are able to bring out more details in the replicas than may show in the originals. 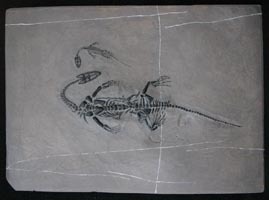 The lighting may be somewhat different between the original specimen and the replica photos. 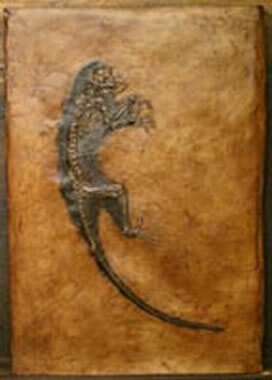 Additionally, since each replica is hand painted, with oil paints and stains, each one is an original painting. Each replica will therefore have slight variations from one to the next. You can't paint the same picture exactly the same multiple times. 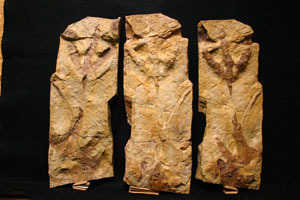 If you go to the "about us" page you can see how some of the molds for these specimens were made (including the Placenticeras meeki above). 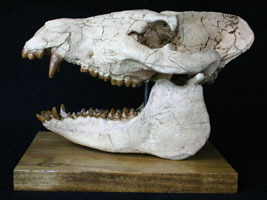 Our latest skull (Perchoerus sp. 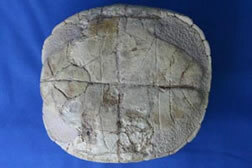 - peccary) is a five piece mold for the top of the skull. 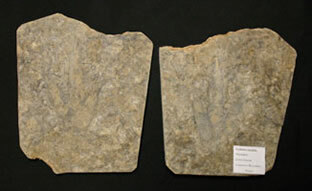 In the Bird?/Theropod track below to the right the original specimen to the left and the same piece between the two replicas have a slightly different coloration due to different lighting conditions. You will notice the two replicas on either side of the original have the tracks painted. This is a standard practice and is an example of ways we may alter the coloration of a piece in order to improve the presentation. 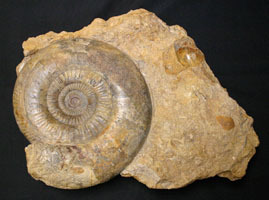 The Syphocrinites specimen, at right, is from Morocco. 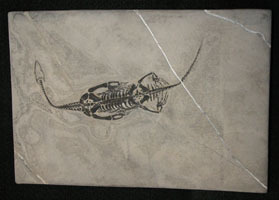 Typically you see several specimens on or covering a plate. 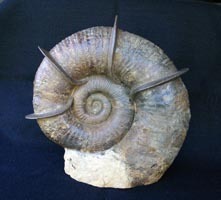 This singular specimen makes a nice specimen for study. 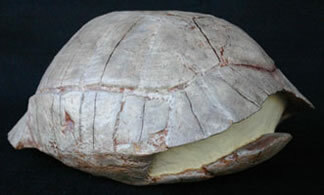 The matrix on the original dinosaur egg nests was covered with a coat of clear polyurethane to protect it from handling and other potential problems. In so doing it brought out the color the matrix would be if it were wet. And is probably how the name of the location that the nests are from gets its name, "The Flaming Cliffs." But, since the area that it is from gets very little rain, the matrix would seldom look that dark. So, we went with a more natural shade for our replicas. 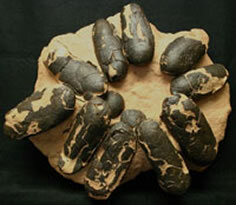 The Oviraptor nest original had only one dark egg. We went for a more consistent overall appearance of the nest and painted them all dark. For the dinosaur footprints from France, as with the footprints from Colorado above, we painted the track to highlight it from the matrix. This is fairly standard procedure to help the tracks be seen. 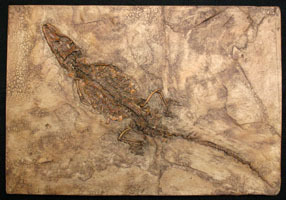 The Messel Gar replica is fairly closely painted to the original. 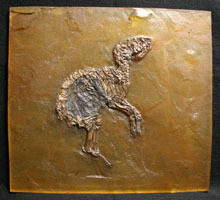 Actually all Messel replicas look more real than the originals due to the fact that because the matrix of the originals is so unstable they are encased in Lucite or resin to preserve them. Therefore when you hold them up to the light you can see light through them, giving them a very unreal look. 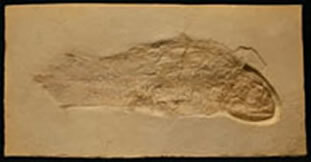 The Solnhofen Coelacanth original has some inconsistencies in coloration. We painted out those inconsistencies in the replica. 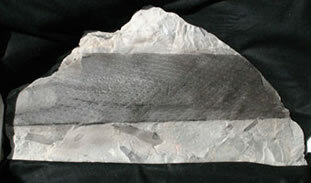 The original Keichousaur from China has several natural veins of calcite running through it. The larger one, under the label is somewhat distracting and was therefore not painted in on the replica. 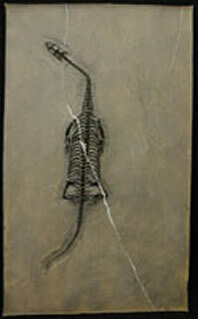 The main vein which ran through the skeleton was painted in because it helped to explain the slight offset in the skeleton. We painted the replica of the Manchurochelys, shell and bones, a little darker than the original to help it stand out from the matrix a little. We used some of the darker color from the matrix to give the shell and bones a more defining coloration. We used a brassy finish for the Bundenbach starfish: Loriolaster and Urasterella. The pyrite on the originals is not quite as obvious as the replicas, but some specimens from the area can be highly pyritized and quite beautiful. Specimens are often x- rayed prior to preparation to help in the process. 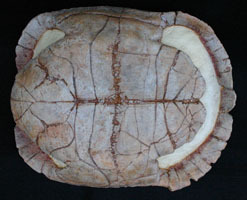 The coloration of the Prionocyclus replica is lighter than the original in order to help bring out the suture lines and other detail. Additionally the photo seems to be a little over exposed causing it to be a little lighter than the painted replica actually is. You can see that a base was added to the replica and the piece is weighted, since it is intended to be used as a bookend. We also have a couple other pieces which we will replicate to be used as bookends or stand alone pieces. 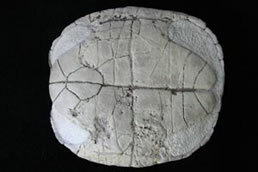 The original Stylemys turtle from South Dakota has a few random dark lines in the carapace which we found to be somewhat distracting from the overall appearance of the piece. We did not include them in the replica. 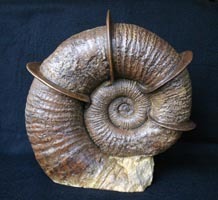 The Prionocyclus ammonite and Stylemys turtle are two of our first three dimensional replicas. Hopefully many more will follow. 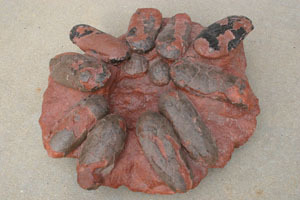 Calamites plate (below) is our first offering in plants. 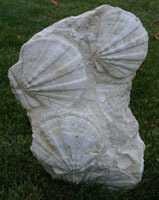 If you look at our Original Casting Fossils section, you will see several others which we will hopefully get to in the future. 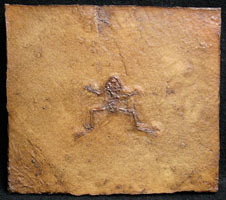 The matrix coloration between the original and the replica is a little different, mostly due to differences in lighting when the specimens were photographed. The original was taken in normal daylight. The replica was photographed under fluorescent lighting which seemed to warm up the colors a little. 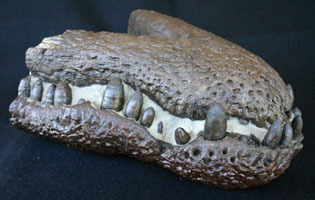 The large crocodile snout (front end - top and bottom) is a Borealosuchus wilsoni from Wamsutter, Wyoming. 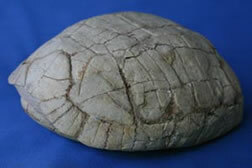 As you can see it is a three dimensional cast. 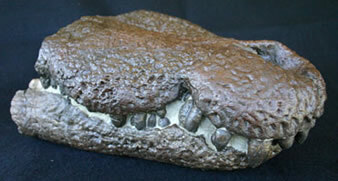 The original specimen had some missing and broken teeth which needed to be repaired for the making of the mold so that the cast would be as complete as possible. 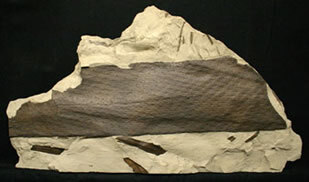 The original specimen had a very red (burnt sienna in color) nose. I suggested to the owner, that he might want to name the crocodile "Rudolph." We did use some of that color on the replica, but not as much, and we blended it in with the other specimen colors so that it would not be so distracting. Our artistic license coming into play again. You can see that, other than reducing the amount of burnt sienna in the replica, there is very little difference between the original and replica with regard to coloration. Obviously, the repaired teeth is a nice variation. 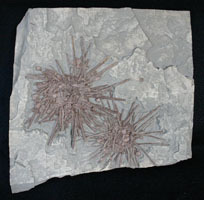 The sea urchin pair (Archaeocidaris brownwoodensis), is from the Brownwood Lake Spillway, in Brown County, Texas. 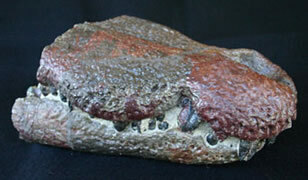 Most of the coloration difference between the original specimen and the replica is due to lighting. 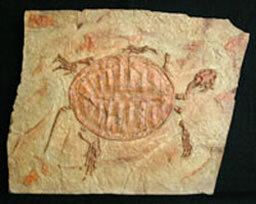 The fossil specimen on the original matched the color of the matrix fairly closely. 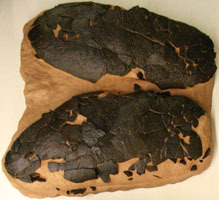 Some areas of the specimen were a little darker with a reddish tint. We used that darker color to paint the entire specimen on the replica in order for it to stand out better against the replica matrix. 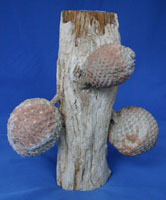 The branch, with three cones (Araucaria mirabilis), is from the La Matilde Formation, Cero Cuadrado Petrified Forest, in Patagonia, Argentina. 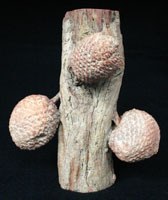 It is extremely rare to have a branch with three cones attached and is why we chose this specimen to cast. The mold for this specimen is a three part mold and you can see the making of this and several other molds by going to our "About Us" page and clicking on the link at the bottom of the page for the Araucaria mold or other mold you wish to see. 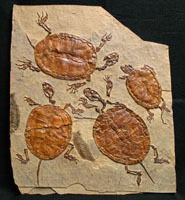 The coloration between the original specimen and replica are fairly close. 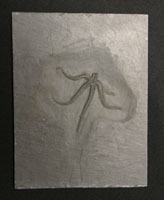 There are a lot of subtle variations in color on the original specimen. 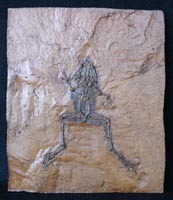 As with all of our replica specimens, we will modify the color from the original, where necessary, to bring out as much of the detail as possible. 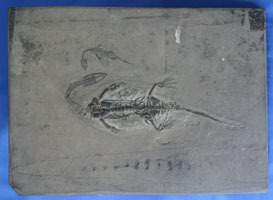 The second Chinese Keichousaur at right is a ventral view which is more common for these little reptiles. You don't get the cranial fenestrae that you get with the dorsal view, but you do get the thoracic and pelvic girdles. It is nice to be able to have good specimens displaying both sides for study and viewing purposes. 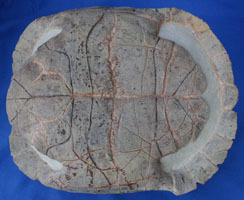 The Chinese Manchurochelys mortality plate at right is littered with fish debris (scales, bones, and fins) as well as partial and near complete fish). Trying to paint all the detail would have been distracting to the replica and very time consuming (thus increasing the cost of the piece). We therefore omitted full blown detail on the piece. 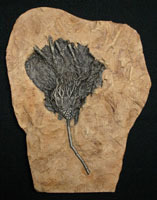 The following eight Messel specimens are all painted with the standard Messel "brown coal" oil shale coloration. 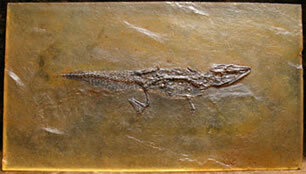 The really wonderful thing about Messel pieces is the incredible detail of fossil preservation in every piece. 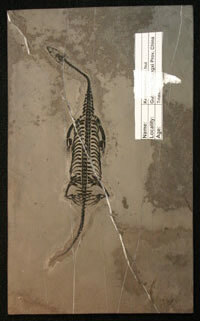 Some of these specimens are represented by only a few specimens of the species, making them extremely rare. We are pleased to be able to offer a nice variety of species from the Messel location. 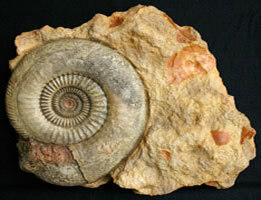 Also see the Messel gar above. These nine pieces plus three others, which be get from another supplier, brinigs our total Messel offering to a dozen pieces. All are complete skeletons and are fully articulated. This is an amazing array of specimens from a single location. 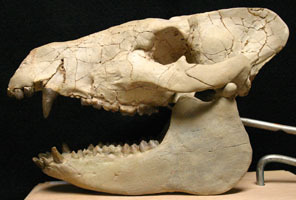 The Perchoerus sp. 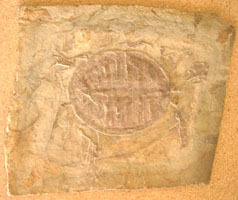 - peccary specimen at right is one of the rarest of the mammal fossils found in the White River Badlands of South Dakota. It is rarer than the cats and nimravids from the same area. They bear a strong resemblance to pigs but belong to a different family. The coloration between the two images is due to lighting. The replica at right appears to be more white than the original to the left. Both are actually similar in coloration with the replica being closer to the original as shown here. You can see how we made the mold for this specimen by visiting our "about us" page, scrolling to the bottom, and clicking on the Perchoerus sp. - peccary link. 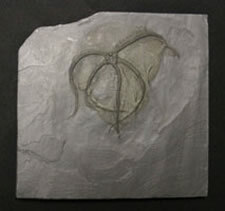 Again, we used a brassy finish for the Bundenbach Rhadinocrinus crinoid. The pyrite on the original is not quite as obvious as the replicas, but some specimens from the area can be highly pyritized and quite beautiful. 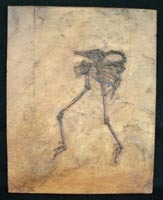 Specimens are often x- rayed prior to preparation to help in the process. 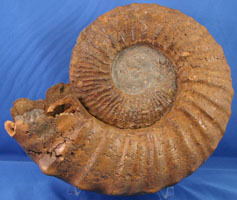 This specimen is a rare Lytoceras fimbriatum ammonite from Dorset, England. 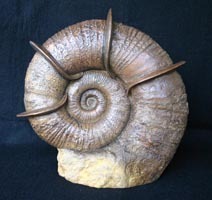 Lytoceras ammonites are rare because they are deep water ammonites that rarely venture into shallow waters where they would be more likely to be recovered if they were to die and become embedded in the sediments of shallow seas. 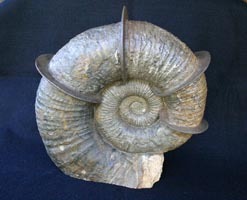 The other feature that makes this specimen rare or unique is that the extended ribs or fimbriatum that you see here are very fragile and are generally lost during the embedding process or when the ammonite is recovered they generally do not survive. So, the fact that the fimbriatum are still intact makes this truly a museum specimen. 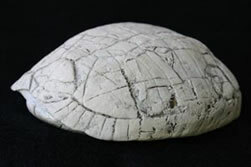 The small Stylemys turtle, from South Dakota, is our latest turtle addition to our offerings. 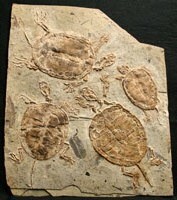 Because of their size, they are often referred to as pocket turtles ( they can fit in your pocket). 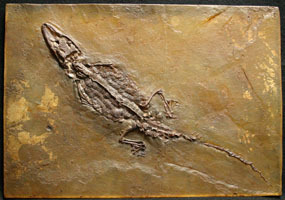 This is the famous Messel primate fossil "Ida." 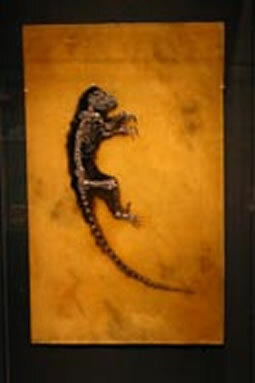 The picture at left was taken at the Denver Museum of Nature and Science during their Extreme Animals display. 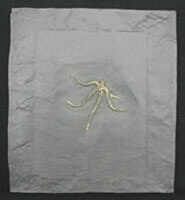 The specimen at left was encased in resin or Lucite and was back lit. This gave the matrix an orangeish appearance. Under normal lighting from the front it would have looked more like the replica specimen on the right. We are the only US company authorized to reproduce "Ida." 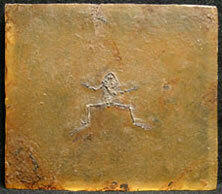 This Scyphocrinites fossil crinoid is very rare. 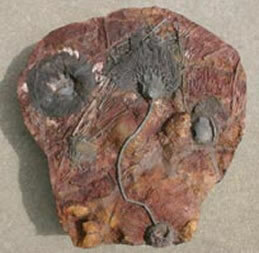 Most crinoids lived attached to the bottom of the ocean or attached to something that was floating on the surface of the water. 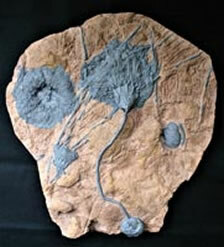 Typically when the crinoid died the calyx, or head, would become detached somewhere along the stem. Occasionally the crionod would die or get covered over before it broke apart. 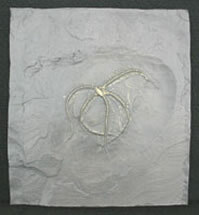 Because that was not common this is why complete crinoids are very rare. 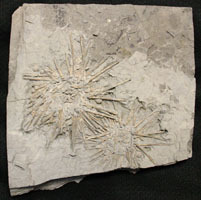 Scyphocrinties was different, it spent its life floating on the surface of the water by means of a float This species of crinoid is almost never found complete because they typically broke somewhere along the stem and fell to the bottom. The float most likely fell to the bottom later due to lack of nourishment. 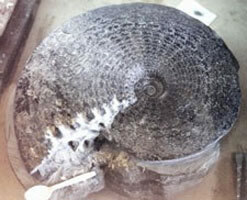 This specimen probably had a damaged float, allowing the entire crinoid to fall to the bottom where it became covered in order to be preserved.. 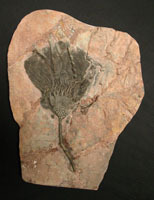 This makes the Scyphocrinites specimen more rare the most other crinoid species. 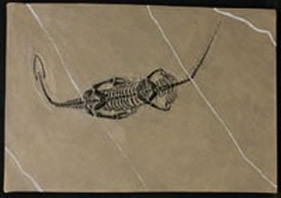 Original Keichousaur - ventral view. 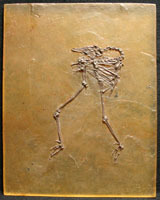 Original Messel Messelornis (wading bird). 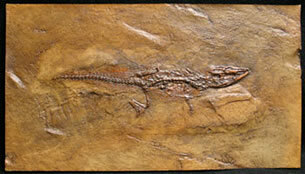 Original Keichousaur pair, "Mother & child." 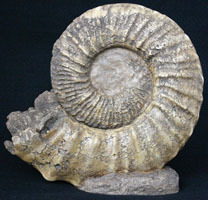 Original small Stylemys front and side view. 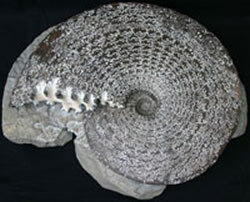 Original small Stylemys bottom view. 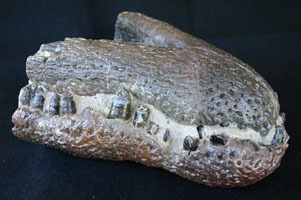 Replica Keichousaur - ventral view. 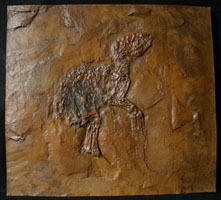 Replica Messel Messelornis (wading bird). 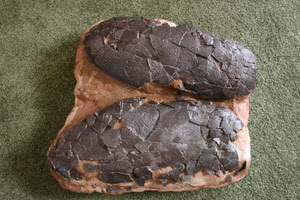 Replica Keichousaur pair, "Mother & child." Replica small Stylemys front and side view. 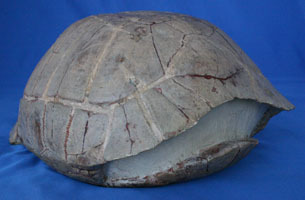 Replica small Stylemys bottom view.